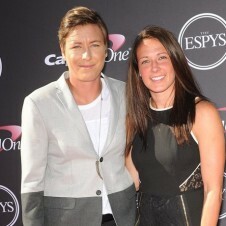 U.S. Women’s National Team (USWNT) soccer star Abby Wambach married her longtime partner, Sarah Huffman, on Saturday in a small ceremony in Hawaii. The 2012 FIFA Women’s World Player of the Year announced her marriage to her New York Flash teammate via Twitter Wednesday. Sources say the wedding took place at Villas at Po’ipu Kai on the island of Kauai in a sunset ceremony which included the couple’s closest friends and relatives. Wambach and the USWNT return to action later this month in a friendly against Australia to be played at the Alamodome in San Antonio.